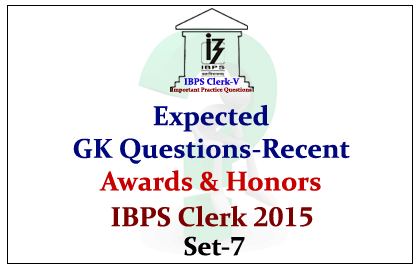 Dear Readers, Important Expected GK Questions from Recent Awards and Honors 2015 for Upcoming IBPS Clerk V Exam was given here with answers. Aspirants those who are preparing for the examination can use this. 1). Name the mountaineer who has been awarded with Tenzing Norgay National Adventure Award by President Pranab Mukherjee? 2). President Pranab Mukherjee has presented the Dhyan Chand Award for sports person of various sports, who among the following is NOT of them to receive the Dhyan Chand Award 2014-15? 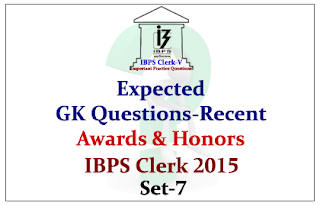 3).Who among the following is the winner of Dronacharya Award for the year 2014-15? 4). Who has been conferred with the Maharashtra Bhusan Award 2015? 5).Former Jalore Electoral Officer (EO) __________ has been chosen for the Election Commission’s Zonal award under the Best Electoral Practices Award 2014? 6). Which of the following university has won the prestigious sports award Maulana Abul Kalam Azad (MAKA) Trophy for the year 2015? 7).Name the Indian Mathematician who won Ramanujan Prize for the year 2015? 8).Who has been awarded with the Pacific Area Travel Writers Association (PATWA) and Safari India South Asia Travel Award 2015? 9).Name the Indian Agricultural Scientist who has been chosen for the inaugural Sunhak Peace Prize? 10).Courageous and Ethical women journalist, Zaina Erhaim has won the prestigious 2015 Peter Mackler Award. She belongs to which of the following countries?